Jeff Tucker first went to sleepaway camp at the Outdoor School Program in Oregon in the sixth grade and has been hooked on camp ever since. He joined the Program’s staff in high school and has spent the last 37 years working in camps in California, Oregon, and Washington. Over the course of his diverse teaching and outdoors experiences, Jeff has taught marine biology on the Oregon Coast, led canoe trips in the San Juan Islands, rock climbed in the Sierra Nevada, and hiked with kids in New York, together examining the remains of a fort George Washington once inspected. 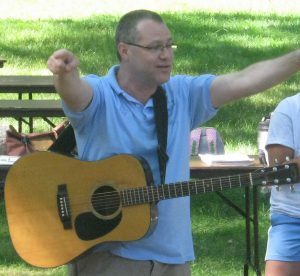 He has worked as a Camp Director since 1995 and takes pride in fostering a strong sense of community among his staff and campers. Jeff has had many amazing experiences, including a minke whale once swimming under his canoe. He is thrilled to join the HFH Summer Camps family after a career teaching middle and elementary school in New Jersey and Seattle. He also plays the guitar and the mandolin, which he brings to camp, and the piano, which will stay at home.